I remember sitting in journalism class in college and hearing the professor say, “It’s about giving a voice to the voiceless.” I never forgot it, because it seemed to me to be the purest way to describe the power of the press. 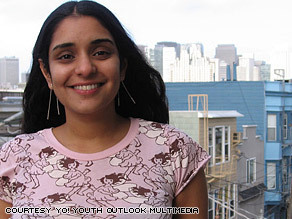 Neela Banerjee is putting the idea into action as the editor of YO! YO! stands for Youth Outlook. It’s a magazine that’s part of a non-profit media group in San Francisco. YO! content is generated mostly by young people who are coming out of “the system”- incarceration, foster care, rehabilitation facilities. “They take cameras into their neighborhoods and show us what their life is like. They are able to show some of the complexity of communities around the bay area that often gets lost in main stream media,” Neela says. This entry was posted in Community contributors, Social reformers. Bookmark the permalink. Have you ever considered being a voice to the voiceless, to the poor Dalits in Sambalpur, Orissa,where hundreds of homes and churches have been burned, hundreds of people have been cruelly killed by fanatic Hindus. It would a great service to humanity. I widh you could do a documentary on the violence there. loved the name – YO! Your originality and spirit make you a credit to your generation. Don’t let anyone tell you that what you do doesn’t matter. This country needs more minds like you. Keep it up! What do YOU do to help the country? with that said, Are you worried that having these young people reporting so candidly on the rough neighborhoods they grew up in will cast an even larger shadow on the kids still struggling to survive in those neighborhoods? bravo neela. we need more people to speak and help others to do the same. You inspire us all! the youth you work with and empower are doing amazing things with their talents. It has been incredible to see the quality and impact of their work…your leadership has made this possible! Journalism is a great work when you do it the right way with sincerely. Go ahead and do something for the people who are waiting for sincere journalists. Be sincere to yourself and to the world. good idea! it’s a great thing to give voice to the voiceless, specially if they are young people who have to find their way of life. Great work that you are doing. I do wonder about your choice of where to do it. With San Francisco containing so many do-gooder types, it seems like the population is already well-served by non-profits. Wouldn’t it be more useful to do something similar in, say, St. Louis, or Tampa, or anywhere where social services are much poorer than in the liberal Bay Area. Neela, you rock. Keep on with your vision and your heart and your power. The world is better off for all of it!! great work! you do make us proud time and again.keep it up! Like you, I am a Bangali too – right from West Bengal – so great to see an young Bangali rise so high at such a young age. That. Is. So. Cool!!! Her idea is so great! I can’t believe she has already started making a difference at such a young age! Maybe her story will inspire others!